Note: Delivery is charged @ £5.99 per item for this listing. 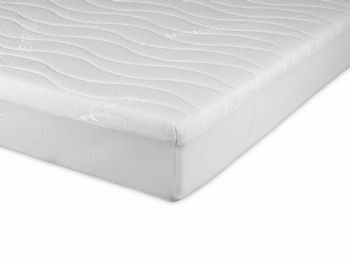 A memory foam mattress has an extraordinary elastic ability to its nature whereby it can mould to the contours of your body to provide amazing support and comfort while you sleep. The drawback of this design, however, is the heat retention. Though useful in the winter season, it can greatly effort sleep patterns during the warmer months, especially those who may suffer from excessive sleep perspiration. The Visco Therapy Memory AirFlow Mattress overcomes this problem thanks to a breathable mesh border in the mattress. A breathable mesh border is a three dimensional woven polyester mesh, designed to reduce moisture under mattresses. Made from 100% non-absorbent white polyester, it allows air to freely circulate; eliminating condensation and mildew build up. It's proven to keep the mattress cooler for a healthy, comfortable sleep.